“Robert K., Candace, Evgeny, Irina, Chris M., Malin and I headed out amongst clouds and showers on Hwy 1 to the Coquihalla. When we arrived at the Zopkios rest area, the sun came out and we were off to tackle a new snowshoe route to Guanaco Peak. 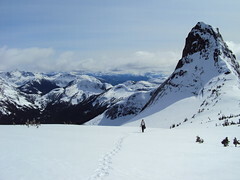 With 30 cm of fresh snow on top of previous spring accumulations, paceline trail-breaking was employed heading up the Zupjok-Zopkios Ridge saddle. We had great fun sliding into the Coldwater Creek basin, then commencing the long slog through ravines and thick forestations to gain the Vicuna-Guanaco col.
Terrain assessments were continuous and we zigzagged to avoid deep powdery slopes (too taxing to go up) and an avalanche runout zone just before the col. It was nearly seven hours into the hike when Irina, Evgeny and Chris Morley summited. All the peaks around us have the names of South American ungulates (Zupjok, Llama, Alpaca, Vicuna, Guanaco), and are sometimes referred to as the Llamoid Group. The clean, massive granitic slabs glistening in the sun were breathtaking – majestic even. We took many splendid photos; lingered and drank in the dazzling vista all around us; and refuelled for the long journey back. Five hours later, we were back in our car, exhausted but decidedly happy.